The ultra urbane New Yorkers of Helen McCloy's detective novels are beginning to remind me of similar sophisticated Manhattanites of the 1920s in the S.S. Van Dine series about Philo Vance. But whereas Vance is the only one who seems to be extremely well read and eager to make literary allusions as often as the wind changes direction in McCloy's world everyone acts like Vance. Was there ever really a New York like the one we find in The Deadly Truth (1941)? Did people really spice up their language with frequent quotes from historical figures and obscure authors? Did mini lectures about chemistry and literature and the science of audiology take the place of regular conversation? I doubt it. Unlike Willard Huntington Wright who to me always seemed to be showing off in the guise of Philo Vance, Helen McCloy makes her erudite characters fit naturally into her mysteries. Her lectures are intrinsic not intrusive to the story. Claudia Bethune, with her multiple marriages and multiple wardrobe changes, tart tongue and wicked ways, is very much like a 1940s version of Alexis Carrington. Life has become a great amusement to her and people are her toys. She is planning a cocktail party to which she has invited several friends and business acquaintances and sent individual invitations stating that each person should try to come as "you are the only one I really want to see." Little do they know that these cocktails will be laced with a new drug she stole from her biochemist pal Dr. Roger Slater. The drug is a derivative of scopolamine with "truth serum" properties enhanced and its dangerous side effects removed. Claudia is eager to find out all the secrets her friends have been keeping from her. The cocktail party is a highlight of the book and gives McCloy a chance to show off her talent for wicked dialogue. The entire sequence might have been lifted from an episode of that hyper-melodramatic nighttime soap Revenge. During the party Claudia manages to goad her guests into revealing a myriad of deep dark secrets. Chief among those secrets are her husband's long time adulterous affair with Phyllis (who also happens to be his first wife) and the plummeting price of the stock in a clothing mill Claudia inherited from her father that has virtually left her penniless. There are other secrets, too, but McCloy cuts the scene short choosing instead to reveal those in the surprise-filled denouement. Truth is always unpleasant and usually intolerable. If I may be permitted to paraphrase Aaron Burr: Truth is whatever is boldly asserted and plausibly maintained. Yet even the speakers of those quotes are vulnerable to the effects of the super dose of the drug Claudia tosses into the bottle of vermouth used to make the night's martinis. She, of course, does not partake of the drinks nor does Roger who spotted a missing tube of the test drug only minutes after Claudia left his lab. He warns everyone to stop drinking while everyone else warns Claudia that she'll pay for her cruel game. But by then it's too late. And it's too late for Claudia as well. Later that night she is found brutally strangled with her prized emerald and platinum necklace. Dr. Basil Willing, psychologist and consultant to the NYPD, is on hand and in fact discovers Claudia in her death throes, nearly catching the murderer in the act of strangling. Claudia is still alive when he breaks into the dining room, but the intricately designed catch on her necklace leaves Basil helpless to free her from the jeweled death trap. Basil is also an "ear-witness" of sorts to the crime. He will remember that prior to the discovery of Claudia he had heard an unusual sound of footsteps and does his best to apply his listening skills throughout the book to match that aural memory to the gait and footsteps of the suspects. Sound and the absence of sound feature prominently in the book as major clues even to the inclusion of a deaf character. 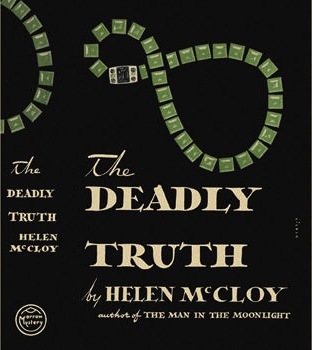 The Deadly Truth is not only a high spirited melodrama of modern mind game playing it is one of the best examples of a fair play detective novel I've ever read. The clues are right there in front of you. Many of them stood out to me flagrantly and yet I was unable to put the pieces together. Why? Because McCloy has ingeniously led the reader down the garden path with a plethora of red herrings that seem to lead to one person when in fact all the flagrant clues most assuredly point to another. It was one of those rare instances of an ending that left me gasping and saying, "That's why that happened!" I'd love to point out some specific examples but that would ruin the enjoyment of joining me as yet another reader fooled by a master deceiver. 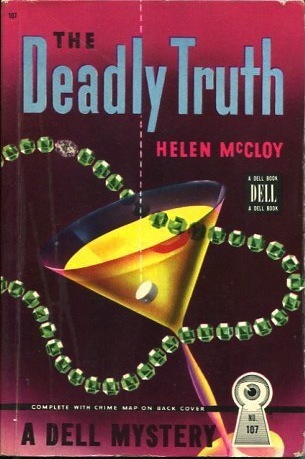 With each new book I read by Helen McCloy I discover that she is indeed an artist of the detective novel. This seems like a fascinating book. Just where on earth do you unearth these books from? Thanks for the review. Here's one author I'd love to read. You're in luck with thhis one, neer. There are multiple affordable copies of the book for sale on the internet, mostly paperback copies. Some of the Dell mapback paperbacks are going for as little as $5. But I'd avoid the abridged Mercury digest editions. McCloy is too good to be cut up and shortened. I agree with John: McCloy is too good a writer to be abridged. Her work is underrated but excellent. Sounds really great John and I love the idea of living in that kind of wise and erudite environment outside of the web. of course, I'd only know what to say about 5 minutes too late - oh well ... Looks like this one might be a bit harder to get affordably on my side of the pond but after a write-up like that I am definitely going to find a copy. Cheers mate. I agree this sounds great. Darn it, I may have to seek it out. I love a good fair play mystery. Picked this up a while back, but have yet to read it. I had never heard anything good or bad about it. Now that has changed thanks to your review. Thanks, John. Also obtained "Dance of Death," "Through a Glass, Darkly," "Mr. Splitfoot" and "The Long Body" after I enjoyed the last Dr. Basil Willing book she wrote, "Burn This." McCloy was immensely talented in her deductive plotting. I've not read many of her later books, but have greatly enjoyed Dance of Death; Through a Glass, Darkly; and Mr. Splitfoot. You have three of her best books awaiting you. I've reviewed three other books by McCloy on this blog. Click here to bring them all up at once. I must read this, John. Gee thanks for adding to my reading burden, but then you nearly always do. I love this sort of thing, erudite New Yorkers in the 40's. I was only a small kid then, but I like to think that's the way it was. In fact, people then did use quotes and such in their conversation, much more than anyone does now. When I do so, people stare at me as if I'm nuts. In those days we were taught to memorize certain things, like poems and sayings and sections of Shakespeare, etc, etc. It became part of who we were and naturally, part of our conversation. I've never heard of Helen McCloy, but I will definitely look for this book. Incredible! We have published an article on a different novel of McCloy, almost the same time. A record! Did you read "Cue for Murder" by McCloy? Or.."Mr. Splitfoot"? Very beautiful. But among these, it's more better the first! I've read seven of McCloy's books so far, and both of those you mentioned. I've reviewed three (now four) of them here. Click on the Helen McCloy tag and you can see which ones I've written about previously. I disagree with you - I think Mr. Splitfoot is much more accomplished than Cue for Murder. Do you say? Mmmhh I don't know. I've read five-six , I don't remember well, but Mr. Splitfoot left me unsatisfied. The final solution isn't more satisfactory for my taste. I always take into consideration the entire book - the structure, the characters, the plotting. 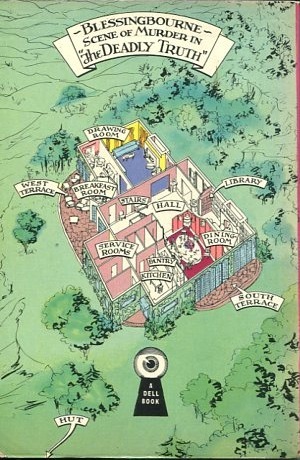 Mr. Splitfoot, for me, was overall a very well done mystery novel in all aspects. Cue for Murder had some strangeness in it that bothered me. I do, however, think it's one of the best detective novels of its era that deals authentically with the theater world. It's much better than any of Christie's books with actors as main characters like Murder in Three Acts and Lord Edgeware Dies. McCloy knew the stage (both on and more importantly off) so well you'd think she were an actress or stagehand at one time in her life. She wasn't. She surely must have known someone closely involved in theater. It's 100% accurate. I've read Deadly Truth, Cue for Murder and Mr. Splitfoot and liked all of them!